Rice is the staple food of Japan. There are many words for it, from the plant to the cooked product. Many of them are kigo. 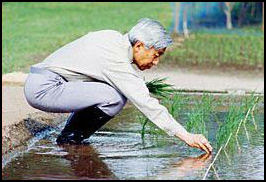 Japan is a rice-growing culture. It has many regional celebrations and rituals related to rice growing and harvesting. Rice is traditionally much more than just food. The Great Food Offering —in which the Emperor spends the night with the Sun Goddess as a dinner guest—is something every emperor is required to do shortly after ascending to the throne. First recorded in A.D. 712, the ritual takes place at night because the Sun Goddess is in the sky during the day. The rite follows a ritual bath, symbolizing purification, and takes place in two simple huts, made of unpealed logs and lit with oil lamps, erected on the Imperial Palace ground in Tokyo. 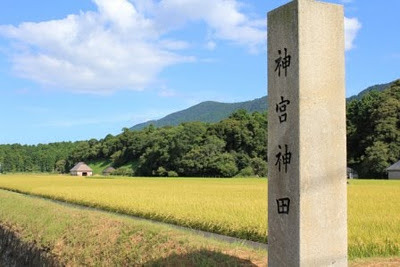 The huts are believed to represent the original first huts where Jimmu Tenno communed with the Sun Goddess. During the Great Food Offering, the Emperor absorbs some of the Sun Goddess spirit and thus "becomes a kind of living ancestor of the entire Japanese family." The pre-World War II belief that the Emperor was a living god is based on this ritual. Murray Sayle wrote in the New Yorker, "I witnessed the most recent Great Food Offering....from my position behind a police barrier a hundred yards away. During my chilly vigil, all I saw was a figure in white silk—presumably the Emperor—flitting from one small building to another. It took perhaps one second in all." No one but the Emperor has ever witnessed the ceremony. According to a press release from the Imperial Household Agency, "The new Emperor ... offers newly-harvested rice to the Imperial Ancestor [the Sun Goddess] and the deities of Heaven and Earth and then partakes of the rice himself, expresses gratitude to the Imperial Ancestor and these deities for peace and abundant harvests, and prays for the same on behalf of the country and people." 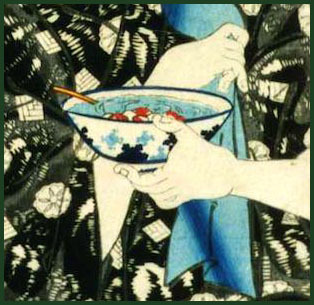 "Celebrations of the First Taste" .
. Inari 稲荷 Fox Deity, Rice Deity . The Great Deity that gives Bountiful .
. Akamai shinji 赤米神事 ritual of the red rice . mikeden 御鐉殿（みけでん） "the sacred dining hall"
for the deities at Ise shrine. A celebration at the Grand Shrines of Ise (Ise Jingū) in which sacred food is offered twice daily, in the morning and evening, to Amaterasu Ōmikami and other deities. Also referred to as the regular sacred offering (jōten mike), this celebration corresponds to the daily offering (Onikku) ceremony conducted at ordinary shrines. 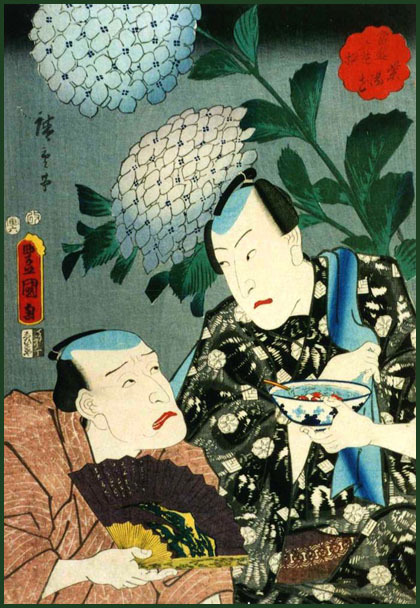 In response to a dream revelation from Amaterasu Ōmikami during Emperor Yūryaku's reign, Toyouke Ōmikami was moved from Tanba Province to Ise Shrine as the tutelary deity of foodstuffs (miketsu kami). Based on this lineage, kami seats (shinza) for Amaterasu Ōmikami, Toyouke Ōmikami, and a "deity enshrined on a subordinate altar in the same honden" (aidono no kami) are built in the Outer Shrine's Sacred Dining Hall (Mikeden). The Mikeden has an ancient architectural style with "log storehouse" (ita azekura) wall construction and steps carved from a single piece of timber (kizami kizahashi). 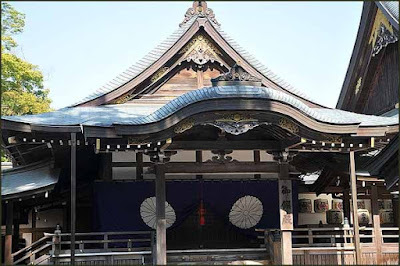 This structure is also where members of the Watarai priestly clan have traditionally served in such roles as senior priests (negi) reciting the norito or as children who observe votive abstinence and serve in ritual services (monoimi). With the Meiji Restoration, shinza were added to auxiliary sanctuaries (betsugū) and senior priests, junior priests (gonnegi), and shrine administrators (gūshō) began serving inside the Mikeden. Although "Meiji-Period Rules for Ritual Procedures at Jingū" (Jingū Meiji saishiki) did not designate this ceremony as a matsuri, the later "Regulations on Ritual Observances at Jingū" (Jingū saishirei) positioned it as a lesser festival (chūsai) and named it Higotoasayū ōmikesai. Whereas other Ōmike ceremonies take place in front of the main sanctuary (shōden) building, this celebration is unique because the deity is "worshipped at a distance" (yōhai) from inside the Mikeden. They are 3 hectar large.
. Ise Grand Shrine (伊勢神宮 .
. shinden 神田 - saiden 斎田 "divine rice field" .
. Hoozuki ichi 鬼燈市 lampion flower market . The koku, kokudaka (石/石高) is a Japanese unit of volume, equal to ten cubic shaku. In this definition, 3.5937 koku equal one cubic metre, i.e. 1 koku is approximately 278.3 litres. 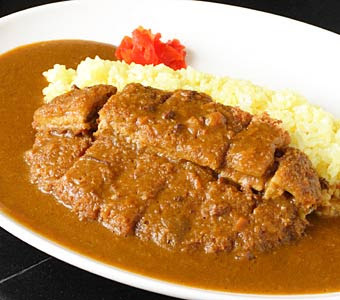 The koku was originally defined as a quantity of rice, historically defined as enough rice to feed one person for one year (one masu is enough rice to feed a person for one day). 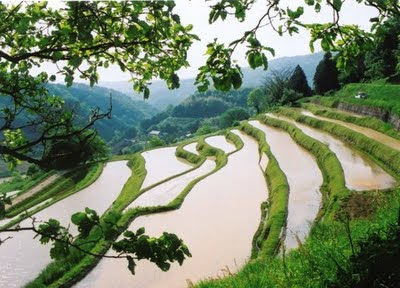 A koku of rice weighs about 150 kilograms. During the Edo period of Japanese history, each han (fiefdom) had an assessment of its wealth, and the koku was the unit of measurement. 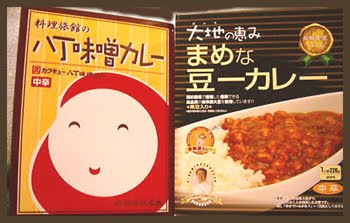 gohan no tomo　ご飯の供　"friend of the cooked rice"
gohan no tomo ご飯の友 "friend of cooked rice"
a spedial brand from Kumamoto. 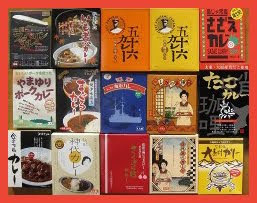 A kind of furikake, with various flavors. Special dish served for celebrations, especially along the Inland Sea and at Takehara. The rich owners of salt production fields served it to their visitors. Various ingredients are finely shredded, the shrimp flavored with salt. The ingredients are served separately on a huge plate. 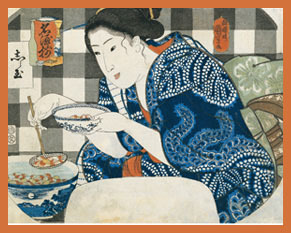 Each visitor takes a bit of each on his bowl of rice, then plenty of dashi soup is added. God and Man eating together . 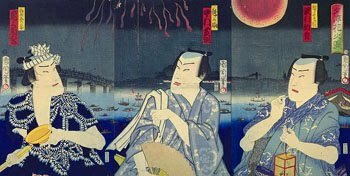 shinsenmai 神饌米 Reis als Speise-Opfergabe in Shinto-Zeremonien. 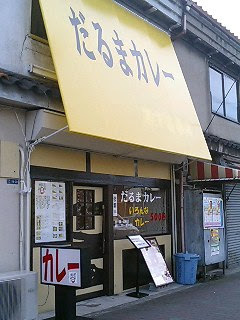 The name comes from the sound of the slowly cooking broth, jiyajiya じやじや. o-kowa, okowa おこわ (御強) "the honorable strong one"
mix of regular Japanese short grain rice and mochi-gome, sticky rice cooked with other ingredients. sakameshi (さかめし　－　酒飯)　"rice wine rice"
special fermented rice kooji used for brewing Sake. It was used by the poor of Edo boiled a bit to make it a Kowameshi 強飯 . This hokku was written on 10/28 (Dec. 11) in 1803, when Issa was living in Edo. The hokku and the hokku following it in Issa's diary seem to be based on a visit to a sake brewery. Issa had just written a kasen renku sequence with the poet and rich merchant Seibi, so he could have gone with Seibi to visit a brewery. In any case, Issa is interested by the newly steamed rice that one of the brewers seems to be inspecting. The rice used in making sake is first washed and steam-cooked (not boiled) and then cooled before it is mixed with the other ingredients. This specially steamed rice is still fairly hard on the outside and is not considered food or delicious. The brewer needs to test its feel, smell, color, body, and whether it's been cooked enough, but it's a dark winter day and there are only a few oil lamps inside for light, so he carries a handful of the rice outside the brewery door, where it's lighter and he can see better. The way the warm steam rises up from the rice through the cold sleet falling on it perhaps suggests the intensity of the brewer's stare and his obvious strong desire to steam the latest batch of rice inside just the right amount. sakurameshi (さくらめし)　桜飯、桜めし "cherryblossom rice"
Usually salt with black sesame (gomajio) is used to sprinkle over the rice, but in the town of Naruto, Tokushima, people use freshly ground white sesame with a lot of sugar. (The salt fields of Naruto provided people with cheap salt, so on a festive day, they wanted to eat something better, sweet sugar. Every year in the sixth lunar month, the Heian court officials would give offerings to the temples and poor begging monks of the capital, Kyoto. Often they also gave some salt. 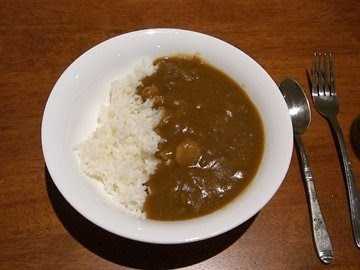 There are many dishes with a plate of rice and various topping, Western style. The influence of Western Food was quite strong in this part of Hokkaido. panchi raisu パンチライス "ice with a punch"
mixed rice since a number of ingredients are added in the rice. usually some nigiri for all the participants, eaten in a hurry to finish the work needed for the day. usually a few slices of pickled radish takuan and plums (umeboshi). It is first placed in front of the deity in a Shinto shrine or a Buddhist temple and the priest performs purifying rites with his wand or chants sutras for purification. Later this rice is sold in the shops to bring happiness for the new year, help students pass the examinations and keep people healthy. Many shrines in Japan perform these rites during the New Year festivities. Click on the photo to see some more. 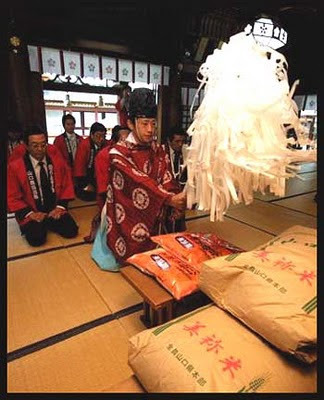 The rites were performed for example at Temple Saidai-Ji in Okayama in January 6, 2010.
peanuts are also consecrated in this way. 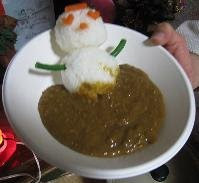 Beans are also consecrated for the Setsubun festivities on February 2/3. 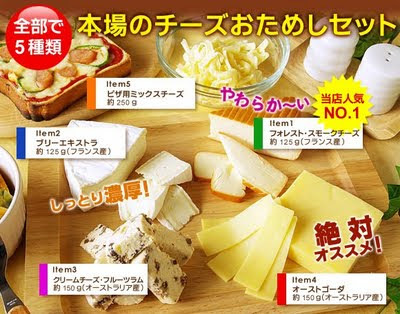 The group "Food Action Nippon" is promoting the use of this, to increase the food self-sufficiency of Japan. Flour is used for noodles, bread and cakes or mixed with wheat flour. Rice gruel (kayu) Japan. Porridge, congee in many kigo. Mostly of woven bamboo, which has some ability to keep the rice from getting bad in summer. Before putting the rice in the basket, a towel is spread to prevent the rice grains from getting squeezed in the holes of the basket. usually layered and lacquered with decorations of sunken gold *chinkin 沈金, carved lacquer *choushitsu 彫漆, mother-of-pearl inlay *raden 螺鈿, or metal leaf decoration, haku-e 箔絵, or sometimes of plain black lacquer, woven bamboo, or pottery. 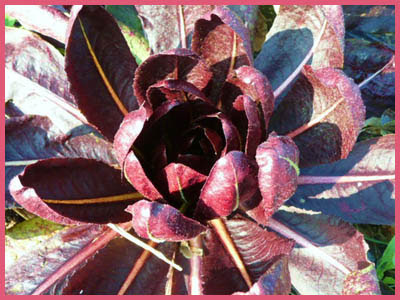 Round, quadrilateral hexagonal, octagonal and circular flower shapes are common. Made in Yuan and Ming period China and in the Ryuukyuu 琉球 (now Okinawa prefecture), jikirou have been imported to Japan since the Kamakura period. They were later used as sweets containers at tea ceremonies. A common type is the juubako 重箱 (tiered food box) usually covered with *makie 蒔絵 and consisting of two, three, five or more tiers to store cooked rice, stewed dished, fish, or raw vegetables separately. 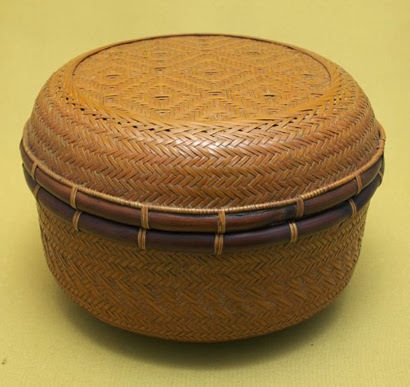 In the Edo period juubako were common at picnics, and used with sagejuu 提重 (a picnic box holding various food and beverage containers in a light and compact form). The upper classes had highly decorated lacquer boxes while the lower classes had plain wood or unadorned lacquered grounds.
. kago 籠 / 篭 / かご　basket, baskets of all kinds . A container made from straw with a lid. The rice containder with the cooked rice (komebitsu) was put it here to keep the rice warm for the next meal. and never take off the lid even if your baby cries. Anfangs choro-choro, langsam anheizen bis es Blasen gibt und man das Blubbern hört, dann kräftig weiterkochen, bis das Wasser papp-pa zischt. Und auf keinen Fall den Deckel abheben, selbst wenn die Kinder vor Hunger weinen. The first slow heat gives the grains time to soak up water choro-choro. When they are full of water they can be cooked much faster papp-pa. And after cooking, keep it standing for a while (even if the children are hungry). Auch die Reihenfolge in der Familie beim Reisessen war festgelegt. Even the order of eating rice in the family was given. Then the menfolk, starting with the eldest. Next the mother-in-law and other in-law family members. Finally the daughter in law. mame no ko meshi is cooked rice sprinkled with kinako bean powder (kinako meshi きな粉飯), which can be formed to musubi balls. This is simple but nurrishing food for the very poor. sakura-gari is an expression referring to the elegant cherry blossom parties of the court of the Heian period. The normal word would be hanami. Here Basho contrasts the simple food with a free enjoyment of blossoms, just right for the haikai friends in Ueno. A disciple from Iga brought this dish to his master. He was the younger brother of Ishikawa Hokkon 北鯤. One of his hokku is in Sarumino. 1683. 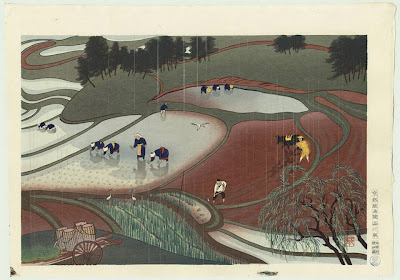 Basho is reminded of a a line in the poem by the Chinese poet Du Fu (Tu Fu), imagining the rice gruel at a shop in Seidei town. He is also comparing his disciple Senten to a crane, which likes dropwort very much. Senten spared some of his own rice and gave it to him. of Seidei pond are best. 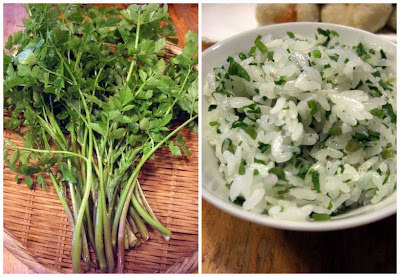 Seidei 青泥 was a town near the capital of Cho-an 長安, China.
. Japanese parcely 芹 seri, dropwort . 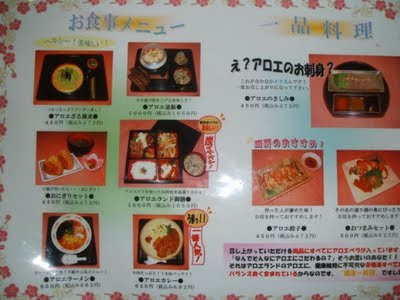 Favorite Rice Dishes from Edo . My photos with RICE !
. Fertility rites - praying for a good harvest .